University College is hosting 50 Brazil Scientific Mobility Program engineering students from universities across the United States. As participants in the Engineering for Economic Growth program, the students will develop and apply the skills most valued by employers in the key industries driving economic growth in Central New York and in the global market. 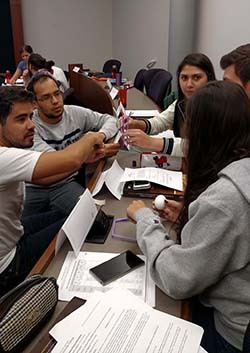 Brazilian engineering students apply their project management skills to solve problems and engage in team building. Over the next eight weeks, students will actively engage with leaders as they hear presentations, tour facilities and implement projects with local organizations such as C&S Engineers, Cayuga Milk Ingredients, NUAIR Alliance, Sunoco Ethanol and Upstate Medical University. Class instruction is focused on developing the skills the 2016 Bloomberg Job Skills Report identified as harder to find and more desired by recruiters in today’s market—skills such as leadership, communications, creative problem solving, project management and collaboration. Participation in the program will benefit both employers and students. Employers will have support to complete projects significant to their business and students will gain valuable experience and expertise that will give them a competitive advantage as they begin their careers. “While students will leave the program with new sets of skills and experiences, the real goal of the Engineering for Economic Growth program is to give students an understanding of how their role can positively impact growth in their local economy,” says Karen DeJarnette of University College. The Brazil Scientific Mobility Program is part of the Brazilian government’s initiative to grant 100,000 scholarships to students from Brazil to study abroad at the world’s best colleges and universities. The program is funded through organizations within the Brazilian Ministry of Education and the Ministry of Science and Technology and is administered by the Institute of International Education.